For the first time ever, I worked a traditional 9 to 5 job in an office setting. It was challenging at first to be able to sit inside and work on a computer all day, but my tolerance for it grew throughout the summer. This is also the first summer that I haven’t spent at home. I usually work in my dad’s restaurant and take family trips, but I was totally alone this summer. It was surprisingly liberating; I planned my own trips, made my own food, and stuck to my own schedule, but I really missed being home. I finished my longest hike to date, which was nine miles. It was a pretty easy hike through from Sunset Bay to Cape Arago in Charleston, but it was great. Another first is that I went to a brewery for the first time! Turns out that I loved going and breweries are so important to the culture of coastal Oregon; my favorite hangout spot in Coos Bay turned out to be 7 Devils, a local brewery. A few weekends ago, Alexa, Sophia, Keana, and I went whitewater rafting and kayaking on an all-day guided trip. It was super fun and great to head into the mountains after living on the coast all summer. I saw gray whales and the whale lover in me was very happy. I went ocean kayaking (twice) and ocean paddle boarding for the first time, which was incredible. I took a tour of Moore Mills & Timber Company, a timber company based in Bandon; we learned about sustainable harvesting and the importance of timber to the area. The three of us (Sophia, Keana, and I) lived on the campus of a community college, which gave us access to the school gym. And for the first time ever, I ACTUALLY stuck to a gym routine and enjoyed going. My East Coast self was very happy eating In-n-Out for the first time. I also got to try my hand at menu design when my dad asked me to design a dinner menu for his restaurant. It was tedious but felt good to work on something that’s important to him and his business. I finally got to work on Fajr Beirut, which is an organization that provides Syrian refugee women in Lebanon with materials to handmake notebooks to sell, which provides for them and their families. I’m working on bringing that initiative to Virginia Tech and making it its own club! I was able to interview guides and business owners a few times this summer, too. It was fun to design my own questions and go talk to people. It helped me get to know the area a little better and learn about why tourism is so important to the South Coast. One of my favorite firsts this summer was camping! I had never been before (my parents stuck to indoor activities growing up) and I finally got to go with my fellow summer scholars. It was super fun and now I’m working on buying my own gear. One side project I worked on this summer was a photography project for the South Coast Tourism Regional Network. It was a grant-funded project to compile a digital media library to promote the south coast…and they needed models, which is where Keana, Sophia, and I stepped in. I’m usually camera shy so this was a fun way to get out of my comfort zone while eating at local restaurants or having fun outside. Keana and I kayaking as part of the photoshoot. Keana, Sophia, and I were also allowed the opportunity to be on the radio show “Hooked on Oregon.” We went on air twice to discuss our projects and the importance of tourism. It was pretty fun, but the people we met there made it so special to me. They were genuinely invested in our careers and were excited to see where the future takes us; I’ve met a lot of people like that and I feel lucky. During my summer, I was really forced to think about what sustainable tourism really means. Incorporating the economy, the community, and conservation is extremely tricky and it’s hard to balance competing interests. But when that balance is found, some sustainable progress can be made. For the first time ever, I conducted a research project on my own and was able to make modifications to the procedure I was given, so that it can be followed and adapted by future researchers. I finished data collection, exported the data, analyzed it, and finally compiled and formatted my own report. With my research project, I was able to design a poster to present at Oregon Sea Grant’s Final Symposium. It was my first time giving a formal presentation like that and presenting my own poster; it was a proud moment and felt good to have people show interest and ask me questions. So that’s my list of firsts. There are definitely some more, but I’m especially fond of these firsts and the memories they hold. This summer was absolutely one for the books and I feel so thankful to have been a part of Oregon Sea Grant’s 2018 Summer Scholars cohort. I hope to take the confidence and skills I’ve developed this summer and implement them in my daily life. I also want to stay intentional about my “firsts,” because you never know what they may lead to. My favorite photo of the summer. A gray whale off the coast of Depoe Bay. 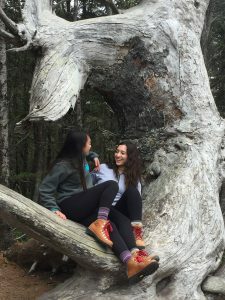 My research project consisted of gathering information on different types of guided experiences and their products/pricing along the Oregon coast. Specifically, I researched salmon charters, whale watching, and kayak tours in 15 coastal Oregon towns. There are three goals to my research: (1) to see what businesses are offering, (2) to see what their products and prices are, and (3) to determine the strength of their online marketing.All three of these goals come together to help us work towards one bigger one: to boost economic development along thecoast through sustainable tourism. One way to do so is through guided experiences, which includes any form of outdoor recreation that is led by a professional. These can include fishing charters, horseback riding, tidepooling, guided hikes, and master classes. When using a guide, clients definitely learn more than they would on their own. Guides know the area better than anyone and can point out wildlife and special features to the area; they’ll also ensure a fun and safe experience for everyone involved. By using professional guides, visitors are creating jobs in the area and encourage sustainable tourism. In turn, with a higher demand for guides, professionals will be encouraged to obtain higher certifications and more training to be more competitive in the industry. I believe that the more you know, the more you see. If you’re more knowledgeable about a topic, you’ll have a greater appreciation for what you’re doing. And who knows more about outdoor recreation than the people who lead these experiences for a living? Since my research is about guides and guided experiences, I was lucky enough to take a guided tour and experience what I had been researching. 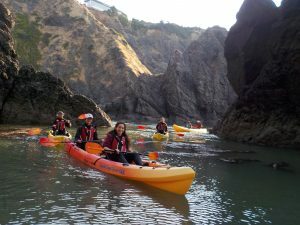 Dave Lacey, the owner of South Coast Tours LLC, took me and two other interns out on a Port Orford Ocean Wildlife Viewing Kayak Tour. Dave founded SCT in 2012, and they offer several types of guided experiences including kayaking, stand up paddle boarding, kayak fishing, and van tours. Along with his team of five other guides, Dave works hard to ensure the safety of his clients and to make sure they walk away smiling, having had a wonderful time on the tour. As part of tour, Dave provided wetsuits, booties, and kayaks to each client. He discussed water safety and explained the basics of kayaking before we launched from the beaches of Port Orford. We paddled through Graveyard Point, Tichenor Cove, Nellies Cove, and through Hell’s Gate and back to the port. 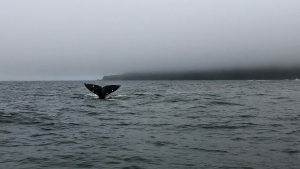 Along the way, Dave was able to point out local seabirds which included brown pelicans, pigeon guillemots, cormorants, black oystercatchers, and common murres, as well as different types of kelp, how to eat them, and their importance to wildlife. 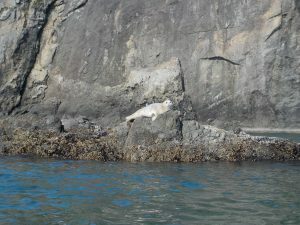 We continued into a cove, where we found a group of 20+ harbor seals, many of them young pups. Dave explained how we should keep our distance and make sure we move slowly so that the seals do not get nervous and hurt themselves sliding off of a rock. We paddled around them and even had some come visit our kayaks! We continued and saw caves and arches, but the water was too rough for us to paddle through; we were able to go through the arch on the way back, though. We kept paddling, with Dave pointing out wildlife such as barnacles, mussels, sea stars, and lion’s mane jellyfish. The highlight of our trip was on the return, where Dave spotted a whale’s spout in the port. We slowed down, and it was headed our direction! We took about a half an hour to watch the whale, as it emerged and dove back down right around our kayaks. Dave explained to us that this whale was likely part of the resident pod and feeding on the kelp beds below us. It was the highlight of my week! Dave even had a camera to take photos of us and videos of the wildlife to send to us. Taking a tour with Dave was a great way to better understand the need for helpful, well-trained guides. During our interview, Dave said that he is always making sure that we are having a great time but is constantly thinking about our safety. He provided high quality equipment, ensured we were comfortable and confident, and was able to identify and teach us all about the local marine wildlife. Without a guide, we would not have had the same experience, especially as people new to the area. South Coast Tours offers wonderful guided experiences that practice sustainable tourism while ensuring happiness and safety to all participants. Let’s Promote the South Coast! Sophia and me posing while hiking in Shore Acres. I’m lucky to be able to work with Wild Rivers Coast Alliance, an organization that funds community projects on the south coast of Oregon. It implements the triple bottom line concept, which consists of community, conservation, and economy, to help boost sustainable tourism and promote economic development in the region. 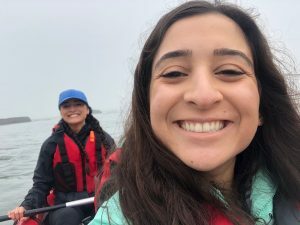 This past week was a little different than my usual job – I, alongside Keana (OSU Marine Studies Initiative) and Sophia (Sea Grant Scholar), got to work on a grant-funded project to create a library of photos to be used in marketing the Oregon coast by the Regional Tourism Network. Two photographers from Portland, Justin and Erik, drove down here to shoot the photos while Keana, Sophia, and I all tried “modeling” for them. We had a busy few days and got to shoot all over Coos Bay, Charleston, and North Bend. We modeled a night out at Seven Devils Brewing Co., awkwardly tried to pose while tasting tacos at the farmers market, pretended to shop in downtown Coos Bay, and ripped into a delicious plate of fish and chips at The Boat Restaurant. A majority of the photoshoot was outdoors. We went on a few short hikes, kayaked and paddle boarded in Sunset Bay, took a buggy in the sand dunes, went crabbing, and explored Golden and Silver Falls. We had a lot of fun and a lot of laughs (especially laughing at each other’s awkward poses, as you can see in these photos). I don’t have any photography experience, much less modeling experience, so it was super cool to see what goes into taking a stunning photo. Justin and Erik had a lot of patience with us newbie models, but I know they took some great photos and we had such a fun time doing it! I feel very lucky to have been a part of this experience. I worked with an incredible team of very talented photographers who captured the beauty of the Coos Bay area. This project was a huge collaborative effort by people along the coast to help promote tourism in this beautiful area; it felt great to be a part of that. I don’t know how or where these photos will be used, maybe on websites, brochures, or magazines, but I’m excited to see! Sophia pretending to look for gray whales. I am very lucky and excited to be an Oregon Sea Grant Summer Scholar. I’m from Richmond, Virginia and have been to Portland once before, so this whole experience is very new to me: new wildlife, new friends, new grocery stores, new sites, new workspaces, and new restaurants to try. And I am now realizing how this newness is important to my position with Wild Rivers Coast Alliance. I’m working on a project that surveys the products and pricing of whale watching, kayak, and salmon fishing tours along the Oregon coast. 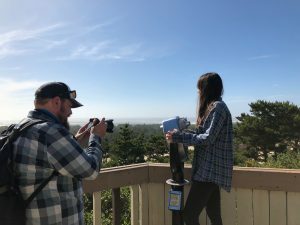 I’ll be analyzing this data to see what kind of experiences are out there and, in turn, communicate these findings to tour operators, scientists, and community members to boost tourism on the Oregon coast. 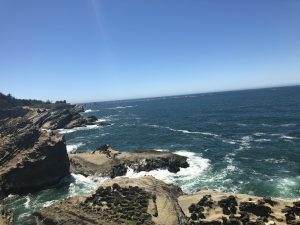 I was surprised by my first impression of Coos Bay. I was expecting a quaint, sweet coastal town like I’d seen on the internet or in movies. Instead, I found a place where nearly 20% of the population lives below the poverty line, have seen many run-down and struggling businesses, driven past several trailer parks, and noticed a high homeless population. There are some really great and beautiful places in Coos Bay, but the town seems to be struggling. I’m realizing that they could really use an economic boost, possibly brought on by sustainable tourism. Being new to this area and being able to make these observations has helped me realize how important tourism can be to these coastal towns and their community members. It has me even more excited to keep me working on my research to see how tourism affects these places. In the meantime, I’m going to keep enjoying this beautiful place I get to call home for ten weeks, keep exploring this new area, and trying to identify all the cool wildlife around me!